The number one priority of Liberty Charter High School is literacy. As defined by Webster, literacy is the process of being educated and cultured. Liberty interprets that to mean fluency and skilled ability with the written and spoken word as well as technology, math, science, media, history, the arts and contemporary culture. To read the rest of Liberty Charter High School's Philosophy of Education CLICK HERE. Congratulations to the girl's and boy's soccer teams and the boy's and girl's basketball teams for making the CIF Division V playoffs. The first round games will all be home games! I’m Linn Dunton and I have the privilege of serving athletes, parents, and coaches as the Director of Athletics at Liberty Charter High School. I became an athlete when I was 8 years old and continued competing through high school, college, and post collegiately in pursuit of the Olympics. Today, I still compete in Masters Track and Field in a variety of events. I’ve also had the joy of coaching at every academic level from elementary to college. What I’ve learned from a lifetime of athletics has shaped me into the leader I am today. My own coaches had a huge impact on not only my ability as an athlete but my development as a person, which is why I’m so passionate about fostering the same kind of growth in our LCHS student-athletes. The LCHS athletic program is relatively young, with our first teams joining CIF in 2009. Today, we field 16 teams across 8 sports and have won 15 league and 2 CIF championships. In just 8 years, our teams have been selected to the CIF All-Academic team 12 times. Other scholar-athlete awards include: Union-Tribune All-Academic Team, Frontier Conference All League Teams, Frontier Conference Player of the Year, and multiple college/university scholarships. In the 2016-17 season, 46% of our students competed in sports. 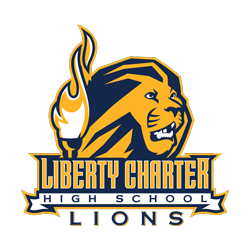 Liberty Charter High School is dedicated to excellence in the classroom and in athletics. We believe our fields and courts are the last classroom of the day. Our greatest priority is partnering with parents and coaches to teach student-athletes character. While winning is our GOAL, developing men and women of excellent character who will make a positive impact at LCHS and beyond is our PURPOSE. We help student-athletes develop critical life skills, such as respect, responsibility, and integrity, in order to be successful on and off the field. A great example of this development is our Student Athlete Leadership Team (SALT). Each semester, our team captains from the current sports participate in a weekly leadership course. Captains are provided with useful training materials and given weekly leadership tasks to complete. These SALT courses provide helpful tools so team captains can successfully lead their peers and themselves. This is just one example of the steps we take to help our student-athletes develop character and learn lasting life lessons. Our highest priority for student-athletes is their academic success and character development. In order to be eligible for an athletic team, students must maintain a minimum 2.0 GPA and have no F’s or unacceptable conduct marks on any progress report. We invite you and your student-athlete to be a part of the Liberty Lions Team. Parents: Click Here to Download the Sports Calendar. • When are Spring Sports Athletic Clearance Forms Due? February 1st. Copyright © 2019Literacy First Charter Schools/ All rights reserved.